This USB to HDMI adapter can connect a computer via USB interface to an HDTV, monitor, or projector with HDMI interface. Support: can support or extend the image picture, maximum support 1080P resolution HD audio and video signals. Support 1080p HD video and digital audio. Product type: MHL Micro USB to HDMI Adapter. 1 x MHL Micro USB to HDMI Adapter. Connectors: 5-pin micro-USB male (connect to device) / HDMI female / micro-USB female (connect to power source). 1 x USB3.1 to HDMI Converter. It supports dual-core CPU more computers Windows systems. Choose it, and you will never regret. Support for USB 3.1 input and HDMI output. Support for: USB 3.1 Input and HDMI Output. The Wiistar HDMI to Male AV signal converter which will convert HDMI video&audio signal to AV CVBS composite signal and the FL/FR stereo audio signals, while support DVI system sideline signals.To help users convert the high quality of the HDMI video signal into normal CVBS signal(standard-definition 480i,576i). New Type C USB 3.1 to USB-C 4K HDMI USB 3.0 Adapter 3 in 1 Hub For Macbook Pro. This USB Type C to HDMI Adapter allows you to mirror your MacBook display to your TV or display up to 4K at 60Hz or UHD at 30Hz. 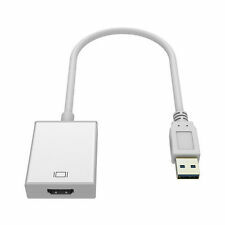 This USB to HDMI adapter can connect a computer via USB interface to an HDTV, monitor, or projector with HDMI interface. Can support or extend the image, maximum support 1080P resolution HD audio and video signals. 1 of 90 Degree USB 2.0 A Female to Micro B Male Converter Host OTG Adaptor Cable. Connect your peripheral devices like mice, keyboards and more to your cell phones with this micro USB OTG (on-the-go) to USB 2.0 adapter. USB 3.0 to 4K HDMI Adapter. This is USB 3.0 to 4k HDMI adapter / converter. It enables connection between 4k Ultra HD display device and a PC using a USB 3.0 port. Resolution: 4K (3840x2160). Backwards compatible with HD / Legacy Monitors. 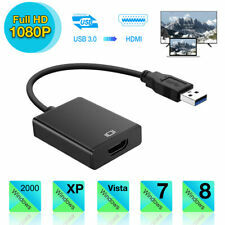 1 x USB3.0 to HDMI External Graphic Card Video Converter. Product through the USB3.0 interface duplicate the information on a computer desktop to another display device (HDMI input), or to another monitor as display extension, with two or more screens simultaneously display different applications to extend desktop work-space. USB 3.1 Type C To MHL HDMI Adapter Cable Cord 1080P Male To Female For Phones. Output: HDMI (1080P);. USB3.1 Type C (MHL) To HDMI Adapter Cable 1080 P Male to HDMI Female Convert to MHL Function Phones. USB C To HDMI Adapter USB Type To Vga HDMI 4K UHD Converter Port HUB For Macbook. USB C To HDMI Adapter USB 3.1 Type C To Vga HDMI 4K UHD Converter Port HUB for Macbook Pro. USB-C to HDMI Adapter Supports video resolution up to 4K 30HZ. This Converter ensures that there is little difference in performance between a directly connected screen and an extra screen connected by the USB 3.0 Graphic Adapter. With this product, you can greatly share and enjoy videos or slideshows on the big and high definition screen with your family and friends. Yellow-Price 1080P HDMI to AV 3RCA Converter for you. 1080P HDMI to AV 3RCA CVBs Composite Video Audio Converter. Convert high quality of HDMI video signal to normal CVBS(AV) signal (standard-definition 480i, ). 1 x HDMI Adapter for Nintendo Switch. Port: Type-C male and female, USB 3.0 female, HDMI female. Connect HDMI and turn on TV/display screen. Connect to Nintendo Switch.